I will interchangeably use flute and recorder because the design of the flute and mouthpiece as modelled after the Thai traditional flute called the “Khlui”. It had a simple but functional design which could easily be applied to a 2 hour workshop. 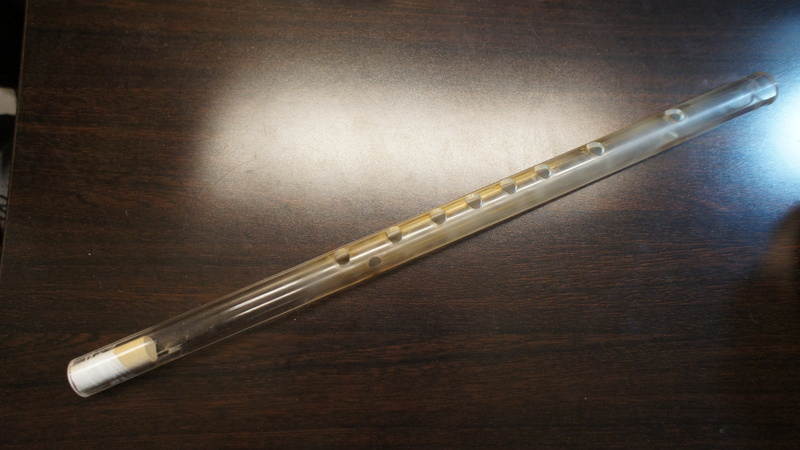 In Thailand, this is called a “a flute”, but in the Wester world, the timbre of the sound is associated with a recorder. The sound producing mechanism is also closer to the recorder than that of a flute. But why bother with nomenclature specifics! During the 14th century, our modern day “accepted” flute was actually not the standard shape and was called the “German Flute” because it was played horizontally as opposed to vertically. The laser cutter comes with a Rotary Stage designed to hold objects like vases and mugs for custom etchings. It is in fact not designed to cut holes in tubes. We designed a special device that fits onto the Rotary stage and also grips onto the flute exactly. Moreover the we designed it such that a small sacrificial wooden dowel can slot in the middle and prevent the laser from damaging the diametrically opposite side. The power settings still need to be fine tuned, but a working CEID flute has been made! Since the flute is also made from clear acrylic, I was thinking of making a simple arduino circuit to measure the frequency or air pressure coming out of the instrument and using that to modulate RGB LED’s. One could also place IR emitters and receivers below the holes to detect what holes have been pressed and make a Disco party flute.